Just another day spent getting from one location to another. This roadside stop was pretty bare, not much shade but we managed to park under a tree. 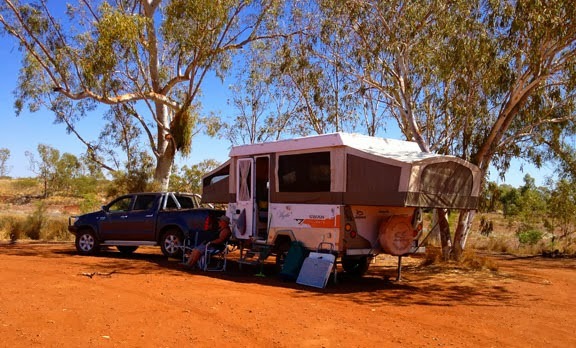 Every time we pull up somewhere, no matter if its a free camp or a caravan park I've got into the habit of getting out my mobile and checking where West is. That way I know where the sun will go down and hopefully position ourselves so we get a bit of afternoon shade. Now I am a pretty positive person and I try not to see the negative side of people or complain about others faults, but OMG our neighbours at this stop drove both of us crazy. When they pulled up they almost skidded into me sitting on my chair! First thing they did was jump out of their car and come over to us to see if we could get their fridge working on gas. That was fine I helped as much as I could. Couldn't get it going though something wrong with the flint. Well for the rest of the night they kept wandering over to us complaining about everything. Now I don't want to generalise but they were the epitome of the cliche whingeing poms! They didn't like the UK so came to Australia to live, started in Melbourne and didn't like it so they went to Queensland, didn't like it so went back to the UK. Then came back to Australia because they still didn't like the UK and this time moved to Perth. Perth was OK but they still pointed out all the stuff they didn't like about it!!!! There wasn't one thing that came out of their mouths that was positive. Then the next morning their alarm (alarm on holiday??) went of at 5.00am and they started their car up while they got ready to leave. The car then continued to run for the 1 hour while they got organised. They would have had to stop at the next roadhouse to fill the petrol tank up. But finally they were gone and I could get rid of the negative environment. Michelle I got out my Black Tourmaline spray and sprayed it everywhere! The only good things about running into this couple was they made me realize how you can waste you life on the negative stuff or just enjoy being alive. Also there alarm woke me up early enough to get to look out my window and see the beginning of another wonderful day. Yeah Michelle we have to get a positive out of situations like this. Thanks for joining me on my adventure. I'm sorry Davine but I have to laugh, some people are just like that and it seems no matter what you do or say it's never ever going to be good enough. Or if you share something good with them, they most likely would have to top it. Now if only they could see what they have to be grateful for, such as having the luxury of moving all over the world and not thinking twice about it, or the fact that they have food on the table, clothes on their backs or one of a billion other things they could be grateful for... they'd sure appreciate life that much more and they might even be happy campers! lol I love your positive out of this, you go girlfriend and chase that negativity right outta there, well smile as it drove away I hope! Yup, some people... but the joy of meeting individuals such as them, well you can gain a new sense of appreciation for everything, life itself! I know you're a positive individual, who knows why this couple was put into your life, but I bet you've since laughed at the insanity of it all. I smile at your parking under a tree, not a lot of trees to choose from but at least you got a bit of shade and smart thinking to find the west! Enjoy all you do and do all you enjoy my friend. Cheers. Seems like you are 'getting your barrings ' with finding where west is and going from there. These people can pop up anywhere, can't they! Imagine that they found you guys way out there!! I agree that these 'types' are put here to allow us/the rest to appreciate the moment more.